Global SAR in Space Sector Market size was worth at around USD 1.4 billion in 2017 and will witness gains at 11.5% from 2018 to 2024. Information obtained from the spaceborne radars are utilized for critical applications such as monitoring tectonic plate movement, glacier shrinkage measurement, tracking ocean currents, monitoring ground water levels, vegetation conditions, and overall biomass. This can be credited to high penetration capability of microwaves; the electronic aperture is used to obtain high resolution imagery for these applications. According to the NISAR Science Workshop in 2015, natural disasters that included phenomena such as hurricane, earthquakes, tsunamis, and floods had claimed 1.2 million lives over the duration of 2000 to 2012. Moreover, the estimated damage through these disasters was valued at over USD 1.7 trillion and 2.9 billion lives were affected. Thus, to improve the situational awareness and mitigate these threats, government agencies are expected to adopt advanced sensing and monitoring systems. This will present strong growth prospects for the SAR in space sector market share over the forecast timeline. Synthetic aperture radars are featured with the ability to perform efficient data collection even in difficult weather conditions or in the absence of light. However, optical imaging systems require optimum natural lighting conditions and absence of cloud cover for efficient functioning. This reduces the information accumulation efficiency of the earth’s surface by over 75%, in turn influencing the commercial and government bodies towards the utilization of spaceborne SARs operating in the microwave frequency band. High upfront cost of designing, development, deployment, and other additional accessories for relaying the information back to the controlling stations are among the prominent factors hampering the SAR in space sector market growth. Moreover, conventional synthetic aperture radars can weigh over several hundred kilograms with large space footprint consumption. These factors are expected to negatively impact the overall adoption of these systems. Geopolitical issues existing between the nations in the Middle East and Asia Pacific, and the requirement to gain tactical advantage over the enemy nations has led to substantial requirement of these remote sensing systems. Moreover, potential applications through commercialization of the data for maritime navigation safety, environmental monitoring, and natural resource exploration, are expected to provide strong growth prospects for the SAR in space sector market. 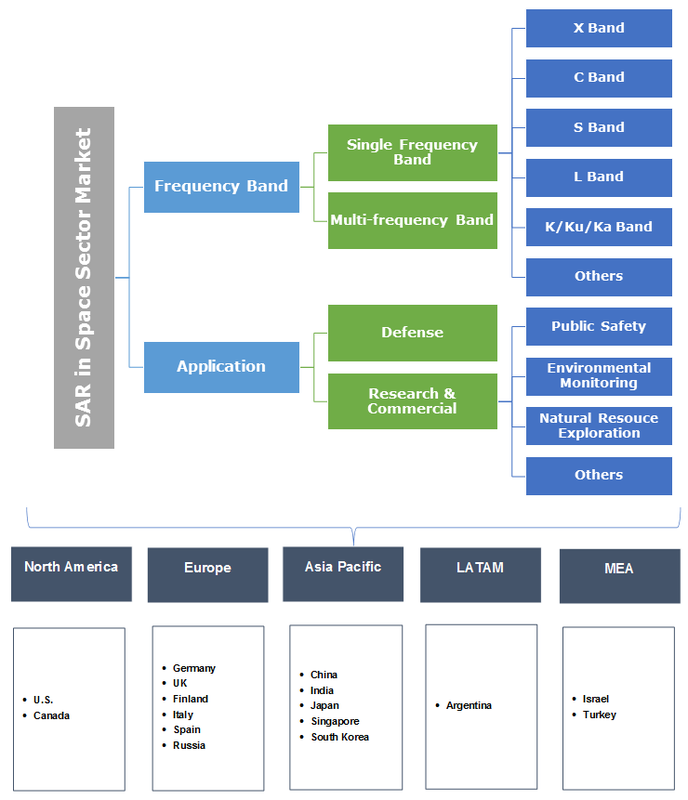 Single frequency band contributed over 90% of the global SAR in space sector market share and is expected to hold its dominance over the forecast period. Critical applications of different bandwidths based on their penetration capabilities are among the major factors driving the industry growth. For instance, X band is favoured for extensive applications in military reconnaissance, surveillance and mapping. This segment contributed the largest share of the overall industry in 2017. C-band finds substantial application for surveillance of sea ice and S band is used for the medium ranged meteorological purposes. Multi-frequency band segment is anticipated to witness highest growth over the forecast years, predominantly owing to its rich information content in comparison to mono-frequency systems. Some of the major multi-frequency SAR missions in the development and operational phase include Chandrayaan 2, Opti-SAR constellation, Sentinel, and RISAT 1. Based on application, defense segment dominated the global SAR in space sector market share. Requirement of military agencies to gain better battlefield intelligence in comparison with their neighbouring enemy nations, utilization of the data for surveillance, and reconnaissance operations, are expected to drive the segment growth through the forecast years. Research & commercial applications are projected to witness highest growth over the forecast timeframe. Segment growth is largely attributed to extensive potential applications for environment monitoring and natural resource exploration. Natural resource exploration sub-segment is expected to present highest absolute dollar opportunity over the forecast timeframe due to its critical requirement for updating the information on the available mineral reserves, specifically in the oil & gas industry segment. Europe is projected to continue its dominance in the SAR in space sector market over the forecast timeframe. Extensive number of ongoing projects in Italy, France, Russia, and Germany are among the major growth contributors in the region. Moreover, significant emphasis on the development of multi-satellite constellations for continuous updates, and global coverage are expected to provide strong growth prospects. North America SAR in space sector market is expected to witness exponential growth during the next few years. Regional growth can largely be attributed to the major ongoing multi-satellite constellation projects in the development phase. These include Opti-SAR mission in Canada and the Capella synthetic aperture radar which are expected to include 8 and 31 satellite constellations respectively. Some of the major SAR in space sector market participants include Airbus SE, BAE Systems, Capella, Harris Corporation, Iceye, Israel Aerospace Industries, Lockheed Martin Corporation, MDA Information Systems, Northrop Grumman Corporation, Raytheon Company, Thales Group, and Uthercast. Key players are increasingly focusing on reducing the overall size and weight of the systems in conjunction with improving the resolution to centimetre lengths. For instance, in May 2018, Iceye raised an investment of USD 34 million in its series B funding round. Owing to its ability to generate two and three-dimensional high-resolution imagery, investors in the project included True Ventures, Space Angels, Draper Nexus, and Promus Ventures. Technological advancement in the industry have led to development of highly compact and efficient radar systems. For instance, in March 2016, Capella Space was founded with an objective to provide hourly updated high-resolution imagery through their constellation of 31 satellites. Technology developed by the company features synthetic aperture radars that are highly cost-effective and compact. Moreover, during their short duration of operations, the company has raised investment from Canaan Partners, Spark Capital, and Data Collective. Industry participants in the SAR in space sector market are expected to increasingly focus on the commercial perspective of the industry. This is owing to high cost of the data obtained through these systems ranging in several thousands of dollars. Development of low cost and high-resolution imagery with minimum capital is expected to remain the key focus of the industry participants to drive their global SAR in space sector market share.